Final revised numbers for 2014 (Jan. ’14 – Jan. ’15) show that 212 (66%) of 322 metros grew their manufacturing employment base. The fastest growing manufacturing metros stretch across multiple states – California, Illinois, Michigan, Alabama, Texas, Kentucky, and New Jersey. 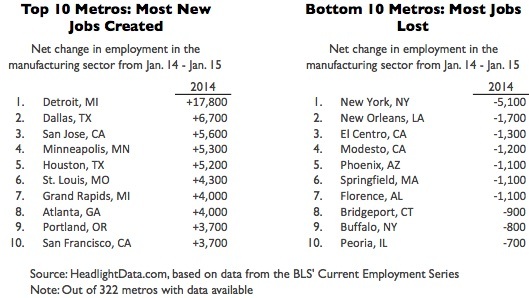 On a net job creation basis, Detroit created the most new manufacturing jobs in 2014 – nearly 18,000 jobs. Dallas, San Jose, Minneapolis, and Houston each created more than 5,000 new manufacturing jobs. 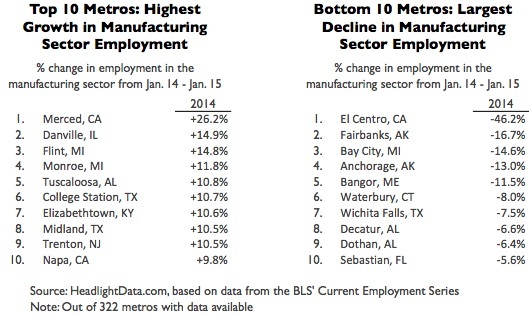 New York City shed the most manufacturing jobs (-5,100), followed by New Orleans (-1,700), El Centro-CA (-1,300), Modesto-CA (-1,200) and Phoenix (-1,100).